Dad was born on the 6th of February 1936 in the town of Ljubno Ob Savinji in Slovenia. He was born in a farmhouse called Kumprejevo and it still exists to this day. His mother and father were Frančiška and Matevž. Dad was the second oldest of six children which included 3 boys and 3 girls. From oldest to youngest there was Franc (who passed away in 1996), then Valentin, then Stefka, Micka, then Francka (who died at birth) and the youngest brother was Janez (who passed in 2012). Both his sisters Stefka and Micka are still living in Slovenia in a town called Radmirje. The family moved between farm houses and at the age of seven they then moved to a farm called “Taškova” in the Ljubno Ob Savinjia region and it was at this time that dad started going to school in Luče further up the valley toward Austria. Dad used to walk to school. If it was good weather with no snow it would take an hour and a half fast walking one way to get to school. If it was bad weather in winter he would stay at home. He went to school every second day with his brother Franc going on alternate days because one of them had to stay at home on the farm and help out their dad with chores. Dad went to school until about the age of ten and then stayed at home and worked on the farm with his family. Growing up on the farm, the social life events consisted of going to local birthday parties, festivals and regular attendance at church. Dad knew of mum from these social events and at one particular party when she wasn’t there, he went off to try an coax her to come to the party but they ended up sitting and talking for the rest of the afternoon. Dad was twenty at the time and it was the beginning of the rest of their life together. Mum and dad got married on 6th August 1960 in Celje, a marriage that was to last nearly 58 years. As interesting fact that dad told me was that one the day that they were married was the first ever time they rode in a taxi and ate watermelon. Dad did National Service in the Yugoslav army when he was twenty-two, and was there for two years. Basic training was in the town of Čuprija in Serbia. It was at National Service where dad was exposed to a whole new world of languages and discipline. Having only spoken Slovenian, he didn’t understand much when he arrived as everyone spoke different languages from the different republics. In dad’s words, ‘It was like I’d fallen from the air into a whole new world”. Naturally, he learnt all the swear words in all the languages, but the main language he learnt was Serbian given most instructions in the army were delivered in this language. Dad’s interest in guns had its origins in the army as they were taught about shooting at targets and ranges and he learnt about what makes the up the parts of the gun including dismantling and reassembling firearms. This hobby and association with firearms would stay with him for the rest of his life and he became an avid hunter. After getting married, mum and dad bought a house in Celje. As times were tough, jobs were few and far between and it was hard to make ends meet, dad’s older brother was working in Germany and enticed dad to follow. Dad went off and worked in a steel milling factory and with the good wages they were able to pay off their house within the first six months. Dad worked in Germany for 2.5 years in which time he was made aware of the Australian Government inviting migrants to come to Australia for work. Mum and dad arrived in Australia just shy of 50 years ago, on the 13th of August 1968 with 3 children – Mark, Andre & Steph. Upon arrival in Sydney they relocated in Melbourne where they soon bought a house in Mulgrave. Lenti, Lidiya and I were born here in Australia. Dad’s early years were spent working various jobs, from factory work to owning his own truck to concreting and driving vacuum tankers and crane trucks. Dad ended up driving crane trucks for the same company for over 30 years delivering containers all over Melbourne. One perk from this resulted in dad being an extremely good navigator around the streets of Melbourne, a human google maps ahead of his time. Dad loved to travel, both locally and internationally. I can vividly remember each summer when we would pack the car and head up to the mountains for two weeks of fishing, swimming and bushwalking. It would be fair to say that by the age of 15 the three younger kids would have hiked and climbed all of the highest peaks in Victoria and Australia, and this with a legally blind child Lenti somehow not breaking his leg on day long hikes. If it wasn’t the mountains then it was the beach and mum and dad spent countless years as Mt Eliza summer beach camp. Around 2004, dad completed a Trans Australia 4WD trip with my brother Andre and his grandson Daniel. Dad also loved his overseas travels and took regular trips back to Slovenia to see his family. In dad’s words, “unless you have climbed Mt. Triglav, you are not a true Slovenian. Mum and dad became immortalised as true Slovenians in 2003 when they reached the summit of Mt. Triglav. Other overseas trips included New Zealand, the USA and Canada. Dad loved the outdoors, and his hobbies and interests all centred on being outside. Hunting, fishing, bee keeping and gardening were his favourite activities, although is somewhat of a miracle that everyone survived some of the fabled hunting trips. I can recall dad telling me about one pig hunting trip which involved 28 hunters shooting wild pigs in a corn field. A straight line of hunters firing guns as they were flushing out the pigs. Some of the pigs inevitably ran between the hunters and where the cars were parked, which you couldn’t see through the tall corn fields. That day over 60 pigs were shot and 5 car tyres required replacement before the journey home was made. Having Andre as a butcher in the family came in handy after pig hunting trips when it came time to make pork sausages and this became a favourite annual event. What better than cured pork sausages with a shot of homemade schnapps? Did I mention schnapps? Yes that was another one of dad’s side interests. Peach schnapps, pear schnapps, apple schnapps or a combination of the fruits although I can honestly say that I haven’t tasted those any of those actual flavours in dad’s schnapps and all the shots I have done with dad. In 2002 dad was home recovering from having a heart stent. maybe due to eating too many home made sausages, dad got interested in bee keeping, a passion he has shared with his son Mark. After starting out with a single hive in the backyard which produced a good amount of honey, dad at the height of his ‘bee-keeping empire’ had seven hives in various locations producing up to 400kg of honey. I was most impressed to learn that the bees were actually registered with the Department of Agriculture and at one stage he was actually ordering queen bees on line from Queensland. I can safely say this was the only time he had ever used the internet. It would be fair to say that the immediate Lenko families have not purchased a jar of honey from a supermarket for over 15 years and many of you sitting here have also tasted his beautiful honey. Dad has always been very active in the Slovenian community, be it the church here at Kew or at Slovenian Association Planica. Mum and dad were founding members at Planica and dad was the first President of the Hunter’s Club as well as being Treasurer of the club for a number of years. He used to love going to the club each Friday night for target practice, although Phil and I who were actually practising in the firing range couldn’t understand how playing poker and drinking schnapps could be called target practice. Each Sunday mum and dad would come to this church here at Kew which was an important part of their religious and social life. I am thankful for this as us kids have made lifelong friends that we met here at church at a very young age, as well as countless teta’s and stric’s (aunt’s & uncles) who treated us like their own children and still do to this day. In December 2012, mum and dad received a Victorian Government Award for Excellence in Multicultural Affairs for the work that they had done here at the Slovenian Religious Centre and at Planica. The common factor between the Slovenian church and the Slovenian clubs is the social network. Both places are filled with people that have followed a similar path to get to where they are now. Uprooting an entire family to the other side of the world to a country where you can’t speak the language is an almost inconceivable concept to me and an incredibly brave decision. So for that and on behalf of my family I thank my mum and dad for doing something that I don’t think I could ever do and giving all of us a very privileged life. In 2010 dad was diagnosed with bladder cancer and had to have his bladder removed. He was okay for about four years then the cancer came back which was successfully treated with chemotherapy. In August 2017, dad had major heart bypass surgery at the Alfred Hospital. The day after the operation the doctor’s found that the cancer had returned with a vengeance and more chemo followed. It was amazing to see the entire Lenko clan band together to come and support mum and dad. Lidiya and Steph have led the way since the initial diagnosis in 2010. Dad decided to spend his final months at home with his family rather than go to hospital. Yet again the girls took charge and organised the entire family and for this we will be forever grateful. The last few months have been amazing and the times spent with dad and all of the family have been priceless. Dad was a loving husband, father, grandfather and great grandfather to 6 children, 17 grandchildren and 4 great grandchildren. He left us peacefully on Thursday morning with a final look at mum before gently closing his eyes and flying to the angels. There have been quite a few things that I learnt from dad in the last month that I never knew about him. 1. He never expected to live past 60 years old because his father and brothers all passed away around this age so he felt blessed in making it to 82. 2. He always wore a white shirt to mass, weddings and funerals. Not only as a sign of respect, but more so because when he was working in Germany he never thought he would ever have a lifestyle where he could afford to buy and wear a white shirt that he saw the affluent businessmen wear. 3. 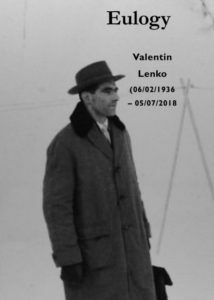 He loved to help new Slovenian migrants in the community because he knew how hard it was to come to a new country, where you knew no-one. 4. He would always use a squidgy after a shower to clean the beads of water off the glass. Even when he was sick and frail he would make sure this was done. The squidgy was hung up in the shower. Last Saturday morning after dad had already left us, mum had a shower and a few minutes after stepping out of the shower and drying off, the squidgy fell to the ground. This is a clear sign that even though he is no longer physically with us, he’s still telling us what to do. Dad had many friends, some who have passed but many of you who have come to farewell him today. He was lots of fun and loved to joke and many of you have shared funny stories reminiscing times spent with dad. More recently during his illness, many of you paid him visits which helped pick him up when things were tough. Mum & the family would like to pass on our sincere thanks to everyone. “I’m now eighty-two and a half. The main thing is I don’t know where to start. You don’t know what is going to happen, a new country and a new life. My life’s come a long way from Slovenia to here in Australia. When I came to Australia my parents and in-laws and brothers and sisters were still alive in Slovenia. Because we all left Slovenia together, Tilka and I, Mark, Steph and Andre, we were not just one. If it was only myself I don’t know how I would manage here. I came with my family, it was easier. I know some people who came here on their own, they have nobody here and they don’t know where to start here. When we came here there were some people I knew here and they were very good to me. When other people from Slovenia come here we try to help them as much as we can. If you’ve got someone beside you to help you it’s good. The children helped us learn the language. Tilka helped me and I helped her, we helped each other, it’s a big thing, we wouldn’t have survived without each other. I’ve been born more than once, once as a Slovenian and once as an Australian. I saw some of my friends back in Germany wasting their money things like playing cards. They would run out of money before pay day. They wouldn’t have any money for bread. I see that life like that is no good. If you start thinking like that you don’t go anywhere. Family life is different, there is kids and there is your wife, there is family. Rest in Peace Stari Ata.